I guess this has happened to us all at one time or another. It’s first thing in the morning and we discover, to our horror, that the box of coffee filters is empty. Yes, we can get some more during the day. But we still have to figure out how to brew that first, wake-up pot of coffee to get us out of the house. There was one time when I rinsed out the old filter and used it again. No, I didn’t taken it out of the garbage! It was still in the brewer from a few hours before. That worked just fine. And once, in my youth, I took the truly desperate measure of using a cotton sock. Come to think of it, I also saw my father once use a cotton handkerchief to brew coffee when we were on a camping trip. Probably your best option, if you have some handy, is to use cheesecloth. 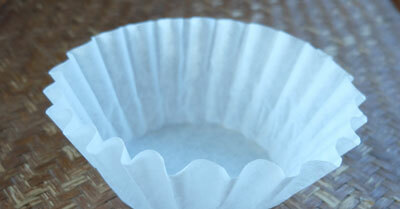 Depending on the weave, fold it over once or twice and then cut it to size so it fits the filter basket in your brewer. Failing that, you can use some kitchen towel. This isn’t a great option, because the water drips through the paper towel at a much slower rate than it does through a proper filter, so it takes forever to make the coffee and the final brew will likely be over-extracted and bitter. In addition, depending on the speed at which your brewer drips water into the filter basket, the basket could overflow and make a horrible mess on the counter. Whichever option you choose, you may want a back-up plan to avoid this happening again. First, you could get yourself a reusable, metal filter for your brewer. Even if you prefer paper filters, it would be nice to have the reusable filter available for emergencies. Or you could get yourself a small press pot. Again, you can still carry on using your regular drip brewer. But if you do run out of filters, you can just grab the press pot, with its metal filter, and use it to make your coffee until you can get to the store. Running out of coffee filters is no fun at all. But if you do end up using a sock or a handkerchief, you’ll at least have something to talk about when you finally get to work!